Small octopus (Jukumi), starting its season in March, has various cooking methods but stir-frying is probably the best way to cook it. Just the sight of chewy octopus simmering in spicy gochujang sauce gives us a good appetite. Small octopus is also good for decreasing cholesterol and relieving fatigue. 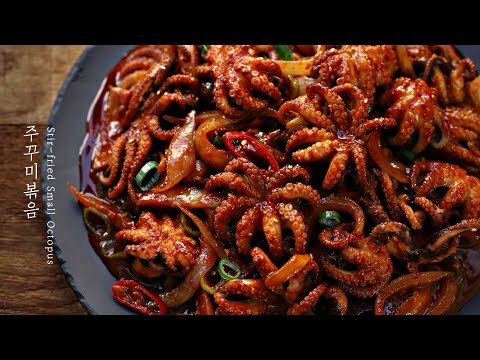 Keep your familys appetite and health with small octopus in season! 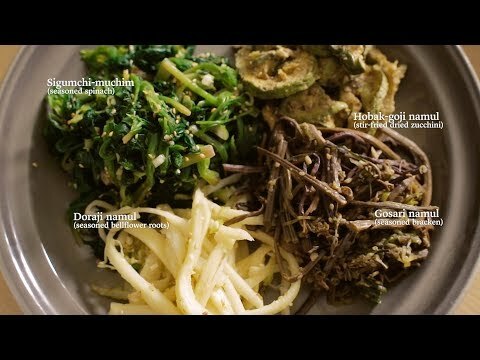 Todays menu is ogok-bap(five-grain rice) and 3 ways namul(seasoned greens) for Jeongwol-daeboreum. Joenwol daeboreum is the first full moon by the lunar calendar. So, we eat ogok-bap and namul on Jeongwol-daeboreum in Korea. Ogok-bap is a cooked mixture of 5 grains: rice, red beans, beans, millets and sorghum. I usually just buy namul, instead of making them because it takes a lot of work. And then, I made simple baechu-guk with leftover cabbage. I think todays meal is a truly Korean home meal. So, thank you for watching. 1. 알배추는 깨끗하게 씻은 후, 먹기좋은 크기로 잘라줍니다. 1. Wash the napa cabbage and cut into bite sized pieces. 2. 냄비에 물과 육수팩을 넣어 20분정도 끓여 육수를 만든 후, 육수팩을 건져내줍니다. 2. In a pot, add broth pack(anchovy and seaweed flavor) and water, boil for 20min and remove the broth pack. 3. 육수에 된장과 마늘, 배추를 넣고 배추가 부드럽게 푹 익을때까지 약불로 끓여줍니다. 3. Add soybean paste, chopped garlic and napa cabbage and boil until cabbage is cooked for 30~60min on low heat. 된장은 사용하는 제품에 따라 염도가 다를 수 있으니 양조절 필요해요! You need to adjust the saltiness depending on the kind of your soybean paste. 1. 쌀을 깨끗하게 씻은 후, 1시간정도 불려줍니다. 1. Rinse the rice and soak for 1 hour. 2. 냄비에 쌀과 동량의 물을 넣어 센불로 끓여줍니다. 2. In a pot, add equal amount of rice and water and cook on high. 3. 끓기 시작하면, 불을 약불로 줄인 후 13~15분정도 익혀줍니다. 3. Bring to the boil, reduce the heat to low and simmer 13~15min. 4. 쌀이 모두 익으면, 불을 끄고 뚜껑을 닫은 채로 10분간 뜸을 들여줍니다. 4. When rice is cooked or starts to smell burnt, turn off and let it stand for about 10min with the lid closed. 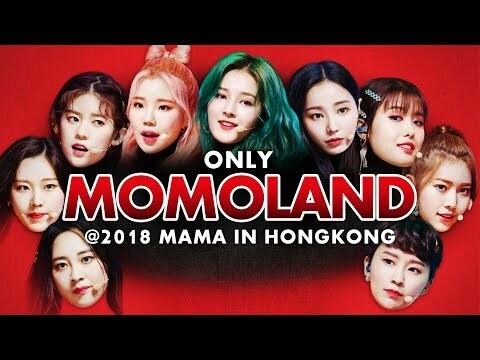 팥과 콩은 쌀보다 더 오래 불려줘야해요. 냄비가 아닌 전기밥솥을 사용한다면, 꼭 잡곡밥모드로 해주세요. You need to soak red beans and beans for longer. But If you use a rice cooker, just cook it on the japgok-bap(multi-grain) mode. 1. 건호박은 찬물에 1시간정도 불려 부드럽게 만들어 줍니다. 1. Soak the dried zucchini in cold water for about 1 hour until soft. 2. 불린 호박은 찬물에 바락바락 깨끗하게 씻은 후 물기를 짜줍니다. 2. Rinse and drain the zucchini in cold water. 3. 그릇에 불린 호박, 국간장, 다진마늘, 다진파, 들기름을 넣고 잘 무쳐줍니다. 3. In a bowl, add zucchini, soy sauce for soup, chopped garlic and perilla oil and mix well. 4. 팬에 양념한 호박을 넣고 볶다가, 멸치육수, 들깨가루, 참깨를 넣고 졸이듯이 볶아 완성합니다. 4. In a pan, pour and stir- fry seasoned zucchini. And then, add broth, perilla seed powder, sesame seed and keep stir-frying until water is evaporated. 저는 미리 손질을 한 고사리를 구매했고, 간단하게 끓는 물에 데친후에 사용했어요. I buy soaked gosari at the market and use it after blanching in boiling water. 1. 팬에 들기름을 두르고, 다진파와 다진마늘을 넣고 볶아줍니다. 1. Coat the pan with perilla oil, add green onion and chopped garlic and stir-fry. 2. 고사리를 넣어 볶다가 국간장을 넣어 간을 하고, 멸치육수를 넣어 수분이 날라갈때까지 볶아줍니다. 2. Add and stir-fry gosari and season with soy sauce for soup. And then, add broth and keep stir-frying until water is evaporated. 고사리에서 군내가 조금 나서 없애기위해 까나리 액젓을 아주 조금 넣었어요! I use kanari aekjeot(Korean fish sauce) to remove the stale smell of gosari. 3. 마지막으로 참깨를 넣어 마무리해줍니다. 3. Garnish with sesame. Done! 1. 도라지의 쓴맛을 제거하기위해 굵은 소금을 1숟가락넣고 바락바락 무쳐줍니다. 1. Add 1Tbs coarse salt to peeled doraji and rub hard for to remove bitterness. 어느정도 도라지가 부드러워지면 물에 한번 헹구고, 찬물에 1시간 정도 담가줍니다. When the doraji is soft, rinse and soak in cold water for about 1 hour. 2. 들기름을 두른 팬에 다진파와 다진마늘을 넣고 볶다가, 도라지를 넣어 계속 볶아줍니다. 2. Coat the pan with perilla oil, fry chopped green onion and garlic, then add and keep frying the doraji. 3. 소금으로 간을 한 후, 참깨를 뿌려 마무리합니다. 3. Season with salt and garnish with sesame. Done! 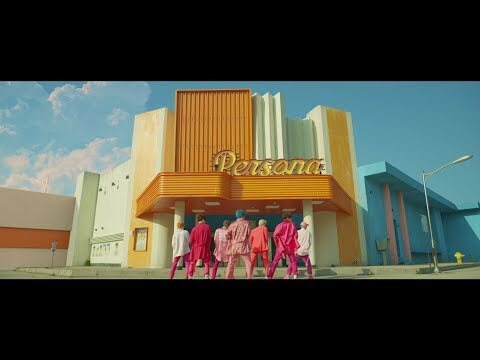 "Boy with Luv" (Korean title: 작은 것들을 위한 시; RR: Jageun geotdeureul wihan si, lit. A Poem for Small Things) is a song by South Korean boy band BTS featuring American singer Halsey from BTS' EP Map of the Soul: Persona. It was released with the EP on April 12, 2019, by Big Hit Entertainment. The video for the song was released on April 12, 2019. It is the most viewed online music video in 24 hours, with over 78 million views in its first day of release.